We left Downtown, Los Angels around 7 am and arrived at Las Vegas shortly after 12 noon. Yes, it took us almost 5 hours (should be just 4 hrs) because we had to do several stops to get food, refill car fuel and toilet break. 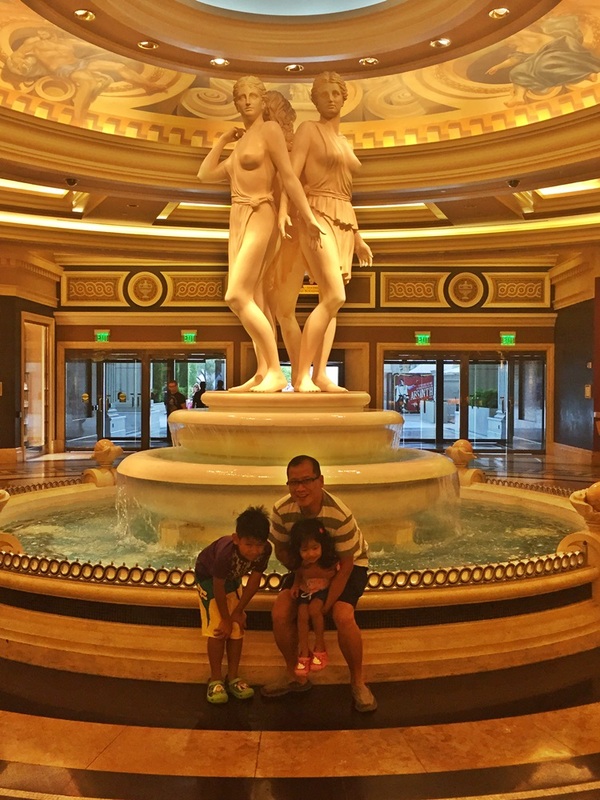 We were not in a hurry because Uncle B was scheduled to arrive at 11 am so he checked-in the Ceasar Palace hotel for us, it was a blessing because there was long line waiting to be checked-in. As soon as our baggage arrived in the room, we headed out to get proper food, it was the first time that the kids refuse to have another bite of hotdog, chips or bread. Our room had 2 queen size bed and had a view of the Pallazo. Oh my jaccuzi! The kids told us that they want to have one in our house, if we have the space. They once had so much fun in the jaccuzi and they did not hear me knocking the door (I left my key card and phone inside), I had to ask a security guy to help me get inside since the phone line to our room had problems as well. Early morning (8 am) stroll at the hotel with Lolo Dino, it felt like we were the only ones staying because the lobby was not busy with guests. Mornings are spent at the Temple Pool area of Garden of the Gods Pool Oasis, if I remember correctly the pool opens at 9am and the pool restaurant open at 11am so we would buy coffee and pastries at Payard Patisserie & Bistro. If the kids made the plans, they would choose to stay in the pool area all day. Madame Tussauds was our first activity at Las Vegas. you’ve really had fun guys!!!! You’re welcome! Thank you for dropping by.